If you are like most school counselors, you probably cannot paint your walls. You can brighten up your school counseling office by adding colorful storage and accessories - even if you are stuck with a drab wall color. I will recommend some items you can use to add color to your office and highlight some of the storage items I have used specifically. I recommend sticking with a few bold colors to create a cohesive look for your office. Colorful baskets and bins are a great way to stay organized and add color to your office. I do the majority of my shopping at Target, so when I saw a colorful basket or a bin on clearance I snagged it! In the picture above I used a green plastic basket to store nerf balls, beach balls and my blow-up dice. In the picture above I use a red plastic basket to store percussion instruments. In this picture above I used stackable storage baskets from Target in blue, green, and purple to store sand tray items and my "talking" fish. 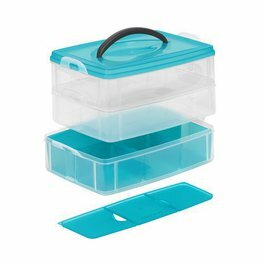 I purchased a few of these 3 Layer Organizers to store items. I had a purple one filled with pencils to give away to students for different things, postcards and thank notes, and rubberbands, paperclips, and pushpins. I had green one filled with beads and craft supplies and colored pencils. You can see the green 3 Layer Organizer I used for art/craft supplies in the picture below in the lower right hand corner. There are also three storage bins on the windowsill in the picture above that I purchased from Ikea. Here they are again below in my 2010-2011 school counseling office. 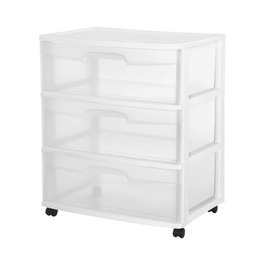 The storage bins are great because they fold down which is great for packing them up if needed. 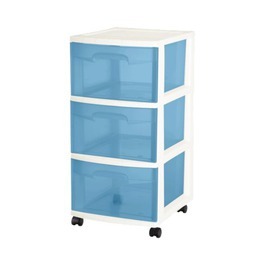 They are no longer available but Ikea has similar ones here. Speaking of IKEA items, this KUSINER Wall pockets hanging storage, pictured below hanging near the door, is also colorful and functional. I actually wrote about the wall pocket in another post about IKEA finds. I used it to store applications for different high school programs and for career items. You can also see a storage cubby that I stole borrowed from my husband. We were using it in one of our previous dwellings. He was using it for something with electronics... then at one point it was in the hallway... When we moved we really didn't have a place for it. So I commandeered it and took it into school. I purchased some red canvas bins for it and voilà - colorful storage! I used it in the picture above to store books and career items. You can also see it here in my 2010-2011 school counseling office. I loved this storage cubby. It is versatile and can be used vertically or horizontally. I had lots more built in storage space in my 2010-2011 school counseling office which is why these shelves are so bare in this picture! As I mentioned above, my 2011-2012 school counseling office did not have any built-in storage. I was accustomed to having cabinets and shelves... I definitely took them for granted. I had to get creative about maximizing my space so I added lots of free standing storage. To add more storage space to my office I brought two Sterilite 3 Drawer Carts I purchased in college to store clothing in to school. They are pictured below in the lower left hand corner. I used purple construction paper and Crayola Slick Sticks* to label the drawers. It is hard to see in the picture, but they are labeled "art supplies," "paper," "games," bulletin boards," "prizes," and "paint." The purple paper added a pop of color and helped to make my office appear cleaner by concealing the drawer contents. *I must go on a rant about Crayola Slick Sticks at a later time because they are AMAZING! I used colorful Milk Crates make great stackable storage. I have used milk crates to store books, organize my school counseling resources, and as shelving. I even had a few under my desk! You can see some here in the lower right corner. Also here on the windowsill on the left. 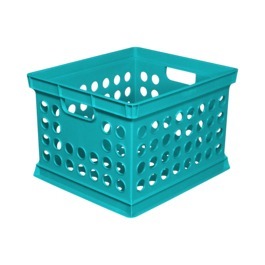 Target currently has Sterilite Milk Crates on sale in stores for $3.49. 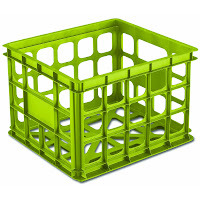 You can also purchase a pack of 6 Sterilite Milk Crates (below) from Amazon for about $35.00 and Free Shipping. Storage items can be functional and FUN! Also, you do not have to purchase new items for your office! Check out thrift stores, yard sales, and ask family and friends for their unwanted furniture and storage items! 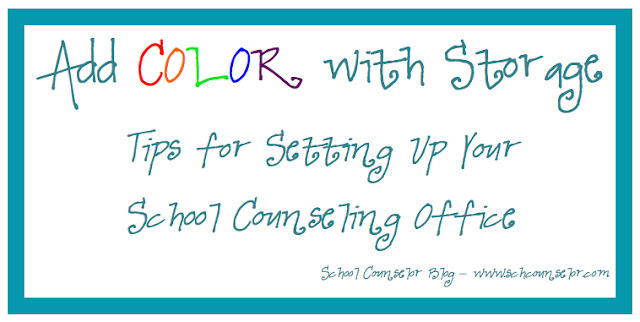 What storage items do you use to add color to your school counseling office? This is the second post in a series of Tips for Your School Counseling Office.